The Cincinnati Reds' 1990 season was a season in American baseball. It consisted of the 91-71 Reds winning the National League West by five games over the second-place Dodgers, as well as the National League Championship Series in six games over the Pittsburgh Pirates, and the World Series in a four-game sweep over the overwhelming favorite Oakland Athletics, who had won the World Series the previous year. It was their fifth World Championship for the Reds, and their first since winning two consecutive titles in 1975 and '76. December 6, 1989: John Franco and Don Brown (minors) were traded by the Reds to the New York Mets for Randy Myers and Kip Gross. December 12, 1989: Tim Leary and Van Snider were traded by the Reds to the New York Yankees for Hal Morris and Rodney Imes (minors). Led by new manager Lou Piniella, the Reds achieved the rare feat of being in first place everyday of the season ("wire-to-wire"). Starting pitcher Jack Armstrong was a catalyst for the team's fast start, as he won 8 of his first 9 games and was 11-3 through the All Star break. Because of his strong first half, Armstrong was selected as the starting pitcher for the All Star Game. Cincinnati was well represented at the 1990 All-Star Game in Chicago. In addition to Armstrong at pitcher, Chris Sabo, Barry Larkin, Rob Dibble, and Randy Myers were reserves. Another new face in the Reds locker room was Randy Myers. He was acquired from the New York Mets for closer John Franco, and became part of the Nasty Boys, along with Rob Dibble and Norm Charlton. Charlton, Dibble, and Myers combined for 44 saves (Myers with 31, Dibble with 11, and Charlton with 2). Myers would become one of the league's elite closers while being selected as an All-Star in 1990. Myers would win his second World Championship as the Reds swept the Oakland Athletics. Dan Wilson was drafted by the Reds in the 1st round. John Roper was drafted by the Reds in the 12th round. June 9, 1990: Ron Robinson was traded by the Cincinnati Reds with Bob Sebra to the Milwaukee Brewers for Billy Bates and Glenn Braggs. June 18, 1990: Rolando Roomes was selected off waivers by the Montreal Expos from the Cincinnati Reds. 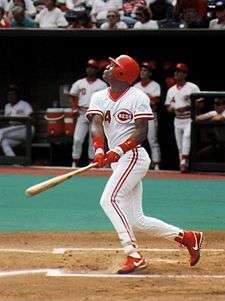 August 24, 1990: Ken Griffey, Sr. was released by the Reds. August 30, 1990: Bill Doran was traded by the Houston Astros to the Cincinnati Reds for players to be named later. September 7, 1990: Butch Henry was sent by the Cincinnati Reds to the Houston Astros to complete an earlier deal made on August 30, 1990. Catcher Terry McGriff was also sent by the Cincinnati Reds to complete the deal. The World Series between the Oakland Athletics and the Reds featured friends at the managerial level. Athletics manager Tony La Russa and Reds manager Lou Piniella were old friends and teammates from their Tampa American Legion Post 248 team. Before the Series, while Peter Gammons of ESPN had predicted an Oakland sweep, Chicago Tribune columnist Mike Royko issued the stunning prediction that the heavily favored A's were "doomed", based on the Ex-Cubs Factor. When the prediction came true, it fueled new interest in that arguably spurious correlation. Cincinnati Reds owner Marge Schott, who was drunk at the time, made a major verbal slip-up when she dedicated the 1990 World Series to "our women and men in the Far East" (Schott meant to say Middle East). In the first inning of Game 1, Reds center fielder Eric Davis hit a home run in left center that nearly hit the CBS television studio where anchor Pat O'Brien was sitting. Also in Game 1, Billy Hatcher helped out offensively in a big way by starting his streak of 7 straight hits in the series (after a walk in the 1st). José Rijo settled in after the early lead and cruised to a surprise Cincinnati victory. The following day, the headline of the Cincinnati Post newspaper captured the city's surprise with the headline, "DAVIS STUNS GOLIATH." Game 4 was a pitchers duel between Dave Stewart and José Rijo (the Game 1 starters) that eventually culminated in the Reds sweeping the series. The A's got on the board in the first when Willie McGee doubled and Carney Lansford singled him in. The game remained 1-0 until the 8th when the Reds finally got to Stewart. Barry Larkin singled up the middle, Herm Winningham followed with a bunt single, and Paul O'Neill reached on a throwing error by Stewart that loaded the bases. Glen Braggs's groundout and Hal Morris's sacrifice fly gave the Reds a precious 2-1 edge which was preserved by both Rijo, who at one point retired 20 straight batters. Randy Myers, one of the Nasty Boys, appeared in relief and got the final two outs. The 1990 World Series would be the Reds 5th championship but would also be remembered as one of the biggest upsets in baseball history. This was the last World Series to be scheduled to begin play on a Tuesday, and the only since 1984. The schedule called for the seven-game series to be held Tue-Wed, Fri-Sat-Sun, Tue-Wed. Games 5, 6, and 7, however were not necessary. The three primary members of the bullpen; Norm Charlton, Randy Myers, and Rob Dibble (who threw a fastball in excess of 99 mph) were known as the "Nasty Boys" – and wouldn't let the A's score against them in nearly nine innings of work. Media talk of a forthcoming A's dynasty led Reds fans to call their own team the "dyNASTY." Reds outfielder Billy Hatcher set a World Series record with seven consecutive hits. In addition, Hatcher's .750 batting average, (9 for 12), broke a mark for a four-game World Series that was previously set by Babe Ruth (.625 in 1928). Cincinnati Reds' pitcher José Rijo became the second Dominican born player to earn World Series MVP honors. The first Dominican born to earn World Series MVP honors was Pedro Guerrero of the Los Angeles Dodgers. ↑ "Surprise '90 Series sweep of A's defined team effort". Reds.enquirer.com. Retrieved August 24, 2012. ↑ "Ron Robinson Statistics and History". Baseball-Reference.com. Retrieved August 24, 2012. ↑ "Rolando Roomes Statistics and History". Baseball-Reference.com. Retrieved August 24, 2012. ↑ "Bill Doran Statistics and History". Baseball-Reference.com. Retrieved August 24, 2012. ↑ "Butch Henry Statistics and History". Baseball-Reference.com. Retrieved August 24, 2012. ↑ "Terry McGriff Statistics and History". Baseball-Reference.com. Retrieved August 24, 2012.